and flying off to it's new home today! This was a fun little project for me. 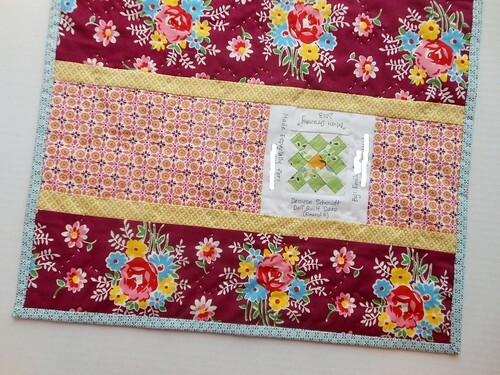 Denyse Schmidt fabrics are among my most favorite, so it was fun to mix and match her collections for this quilt. Trying to be a bit more creative with my label making and quilt backs these days, so this back, with it's super tiny block, makes me incredibly happy. I chose to do a very minimal amount of hand stitching, since everything else I tried was super distracting to the overall design. 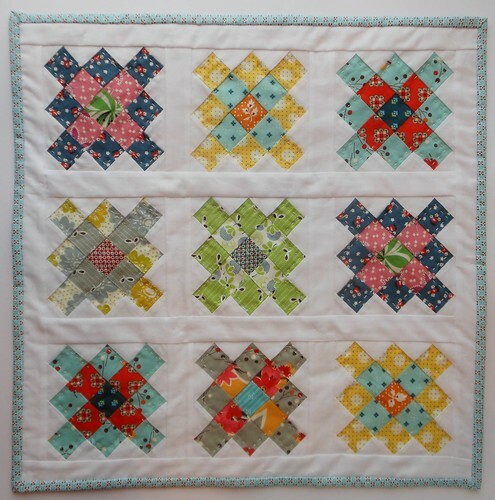 It sort of disappears into the quilt, yet I kind of like it that way. Very cute! I love granny squares, what a fun idea to do a mini version. Really love your granny squares! It is so cute! Turned out really nice. :-) I've been trying to be more creative with labels too, for my current quilt I paper pieces an airplane--lots more fun! This is my first time visiting (through Fabric Tuesday) and I just love the mini Granny square doll quilt. I really love DS fabric as well and I love how you used them and the back is really perfect. I love how you used the block on the back and incorporated it into the label. 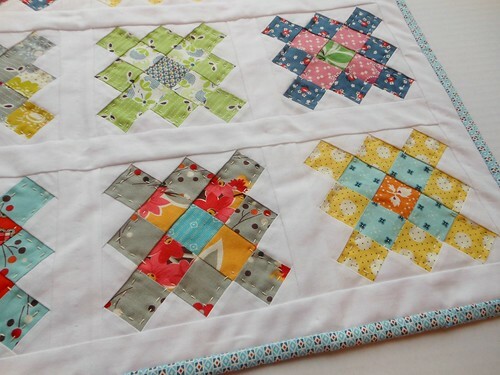 I have yet to label the few quilts I have made so far, but I really like this idea. I will definitely be following your blog now to see what other great projects you make. All very lovely so far! This is so gorgeous. Love the smallness.